At euromaier LLC we believe that personal and direct contact built on trust is the best way to successfully support companies with their international Intellectual Property business. If you are looking for Strategic IP Advice or are in need of independent worldwide information on Patents, Trademarks or Designs you have come to the right place. 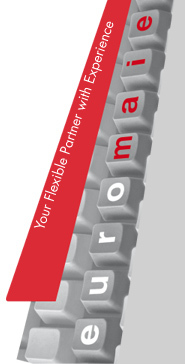 With our euromaier® Services we provide you with the support you need for managing and maintaining your IP rights in Switzerland, Europe and the rest of the World. Our specialty is delivering the information you need quickly and with Swiss quality and accuracy independent of the problem and at the level of detail suited best for the given circumstances. If you need searches of any kind for patents, trademarks or designs in any country or worldwide, we can deliver it to you in a reasonable time and at a reasonable cost. Our visiopat® Services provide you with a unique and simple access to international IP Information published in various languages, customized to meet your needs. We enable the use of the Madrid System for International trademark registration in European countries for businesses based in non-Madrid countries. The product euromadrid offers simple package options at attractive rates for trademark protection in European countries.